The following is a step-by-step outline about what to expect during the pool construction process. During the initial meeting with the homeowners we discuss goals, style, budget, various options, and design ideas for their new pool. We take into consideration that our design reflects their own taste and unique personality, as well as complementing their home and lifestyle. After carefully listening, we transfer the pool elements into a 3-D imaging design for their review and make sure that the swimming pool design is exactly what they have in mind for their backyard oasis. Once the design is perfect, the construction process begins. 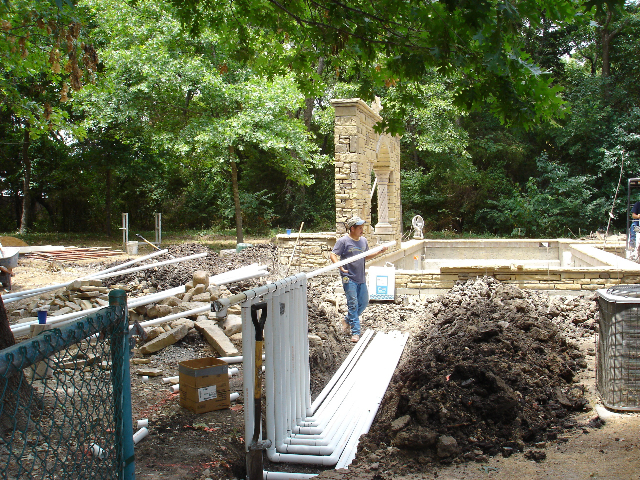 Excavation of the pool begins with leveling the location for the pool area, including the proposed deck area. The layout of the pool is marked out according to the design plan and any elevation changes. Forms are set and the excavation of the pool begins. Excess dirt is hauled away in dump trucks unless utilized on site. The reinforced steel is placed throughout the shape of the pool. The steel is tied to form a grid pattern. In most applications, the steel is 3/8” tied on 8” squares with 8” x 4” rectangle in the floor. However, in unique circumstances, we will use ½” steel tied on 10” squares with 10” x 5” rectangle in the floor. The plumbing inlets/returns, main drains, skimmers, and light niche are also set at this phase. The gunite material, a form of concrete, is applied with high pressure nozzles that create the shell structure of the pool. The 12” bond beam, steps, walls, tanning decks, and love seats are formed as specified. Great attention to detail is given at this phase for the finish quality of the swimming pool. Experienced craftsmen place the tile and coping selected by the customer on the beam around the perimeter of the pool. The tile band is placed in the interior and around the perimeter of the pool at the top edge; this is also known as the waterline tile. There is a wide range of waterline tile to choose from; the most common is 6” ceramic tile that blends with the coping, but many are discovering the beautiful presentation of mosaic and glass tile. The coping material is placed on the top of the beam. Various coping material includes natural flagstone, bullnose brick, cast stone or travertine. Great attention to detail is given to the joints and cuts as they are mortared in. Other pool features such as waterfalls, fountain walls, custom mosaic tile patterns, and specialty items are constructed and installed during this phase as well. The pool plumbing lines and electrical equipment will be installed and tested by licensed professionals that specialize in pool construction. All plumbing is schedule 40 PVC pipe, and the main pool lines each have individual valves. After installation, all lines are pressure tested to assure that there is no leakage. The electrician wires the lights, motors, electronic controllers, and heaters. A conduit is used to protect underground wiring. A freeze guard is set up on every pool system to protect plumbing and equipment against freezes. The electrician will tap into the existing breaker panel in the house for the needed electrical service for the pool. The pool deck is poured on a layer of cushion sand with 3/8” reinforced steel set on 12” centers. Expansion joints are placed about every 8 to 10 feet to allow flexibility of ground shifting. There are different choices for the appearance of your pool deck. Concrete decks can have finishes like: stain, patterned, textured, and stamped. A more natural look is to top the concrete sub-deck with beautiful flagstone or slate. Plaster covers the gunite structure, waterproofs the shell and aesthetically transforms the construction site into a beautiful pool. Since pool plaster is composed of natural materials, which have certain inherent characteristics, a certain amount of shading or color variation is a natural occurrence that should not be construed as a defect. This shading only enhances the natural beauty of your pool. Different pool finishes include white plaster, colored plaster, quartz plaster, or pebble surfaces. Tile is also another beautiful and unique choice for pool surfaces. Mosaic tile now comes in a wide array of colors and custom blended glass tile colors create a dramatic effect. If you're come this far, check out some of our other pool services: custom features and pool or spa remodeling.